The garden bounty is starting to come in, which is lucky since our freezer and larder are nearly bare. We're eating leaf lettuce every day, kale nearly daily, shiitake mushrooms from the old logs under the fruit trees whenever they feel like popping up, lots of chives and Egyptian onions, and masses of eggs. Working with what's in season, I made this recipe with shiitakes and dandelion greens in place of the sweet potatoes, and it was delectable! 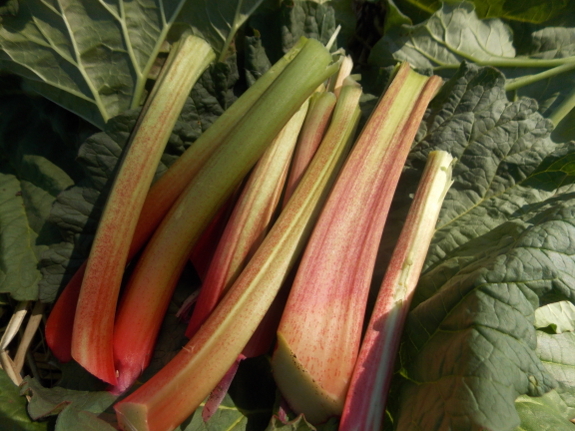 The new crop coming in this week is rhubarb. I have two neglected plants...neglected because I rarely think of eating rhubarb. The trouble is that the sour stalks require so much sweetening, they don't push my good-for-you buttons. Does anyone have a recipe for rhubarb that doesn't rely on copious sweeteners? If all else fails, I'll do what I usually do --- give the stalks to my mother or brother to bake into a pie. I like to stew the rhubarb with a little bit of water and some maple syrup and use it as a sauce for plain thick yogurt. Yum! Not too much maple syrup, just enough to take the edge off the sourness. rhubarb grows on your palate! Looking forward to getting some rhubarb! You can use less sweetener if you use raisins or prunes, or maybe dried apples or even dried peaches, in cooking your rhubarb. Or you might try mixing in some of your jam. When tasting for sweetness, you should let the sauce cool down, first. The whole point of rhubarb is its tonic quality. If you let the sauce be pretty watery, it becomes almost like a lemonade, as a thirst quencher! My folks grew a lot of it in MN , they juiced it as well as freezing it, the juice was used as a mixer to make a "screwbarb" on occasion. When Jay was a baby he used to eat it raw. I like it that way myself. It doesn't need to be sweet. Rhubarb as a savory component is not uncommon around parts of the Mediterranean (particularly in the eastern areas) or in Scandinavia. Those cuisines might have some interesting options. I love Persian food though, so savory stews/braises with tart fruit would be where I would start. My grandmother maintained a bed of rhubarb when I was a child. The only recipe I ever saw was pie. I can't imagine eating it as a veggie. Maybe mixed with other sweet fruits? Good luck. Some things just need sweeting to be palatable. 2 pounds trimmed rhubarb, cut into spears or pieces sized to fit jars; 2 cups water; 2 cups apple cider vinegar; 1 tablespoon canning salt; 1/4 cup honey –or– 1/4 cup sugar; 1/2-inch piece thinly sliced, peeled ginger; 2 teaspoons red pepper flakes; 1 teaspoon whole cloves; 4 whole allspice. Directions: Prepare rhubarb. To make brine, combine water, vinegar, salt, sugar/honey, ginger, and spices and bring to a slow boil until sugar/honey dissolves. Pack rhubarb into sterilized jars, and pour hot brine over rhubarb (bring to boiling just before pouring), leaving one-half-inch headspace. Center sterilized lids and apply bands finger tight. For crispier rhubarb pickles, allow to cool, then place in refrigerator. Otherwise, water bath process for ten minutes. I only have two rhubarb plants, which are more than enough for me. I usually go to www dot rhubarbinfo dot com for rhubarb questions. Lots of good info there.